I wish I could tell you I have a green thumb. And by wish, I mean madly. How is it possible to be as POOR as I am at keeping the green plants (and flowers) beautiful, alive and growing? But, I am. I have killed the impossible-to-kill and the most delicate: orchids. I’m researching and doing my best to provide the habitat that will allow them to survive. If you are ANY good at having a green thumb, I am 100% open to your advice. What to you do to keep plants flourishing in your home? 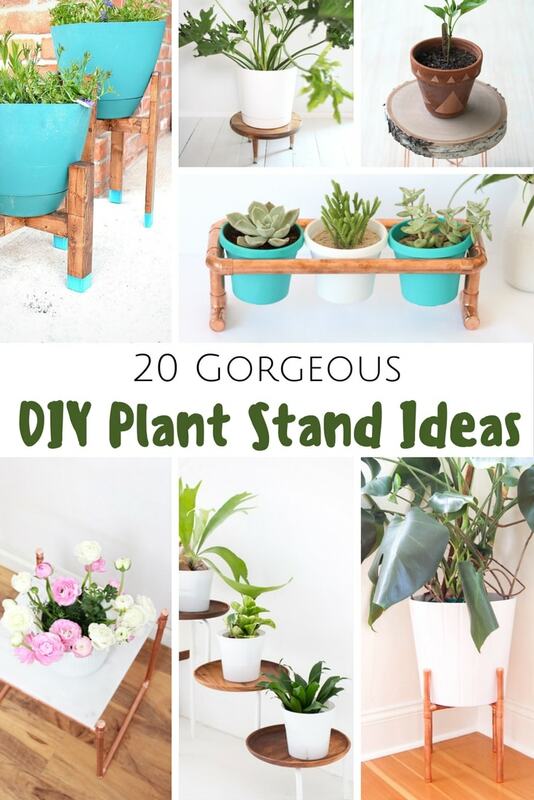 And do you have a favorite plant stand of the ones I shared? You know I always love to hear your thoughts. Thank you so much for allowing me to include it. Beautiful. I was happy to include you. Thank YOU for allowing me to share! Love the mid century modern inspired plant stands. Makes me wish I wasn’t scared of power tools! Visiting from Tutorials and Tips party. I’ve been thinking I need to have more plants inside my home. They look beautiful, and they’re supposed to make the air healthier too. These plant stands would be a great way to showcase a few plants. Thanks for the ideas!